The following recipe is a very simple and quick recipe. It can be eaten with any type of bread like naan, chapati, pita bread etc. 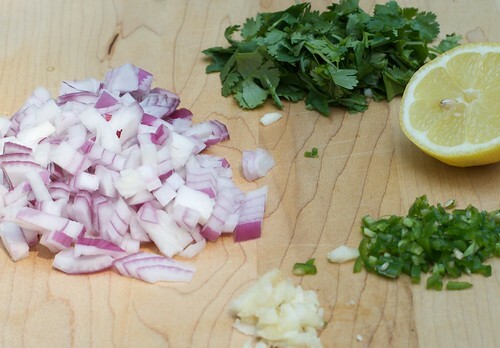 This recipe is made with just a few ingredients as shown in the photo below. You can use Yukon gold or red potatoes or a combination of both. Indian cooking uses a variety of lentils to make all kinds of dishes. From spicy appetizer and entrees to sweet desserts. I will be posting quite a few lentil recipes in the coming weeks to show you the versatility of cooking with lentils but also the different types of lentils that are available and the amazing amount of recipes you can make. The lentil I have used for this recipe is mung dal which are yellow in color. They are also called split and hulled green lentils. Spinach and dill is used to add to the lentil that has been cooked in spices. A big bunch of spinach should be used as it shrinks after cooking. I only use organic and fresh spinach from the University Avenue farmers market in Seattle. It is an awesome farmers market as they only carry local, organic and seasonal produce. I also added a fresh bunch of dill to the recipe as it adds quite a bit of flavor to the dish. If you do not like the flavor of dill, it is okay to omit it from the recipe. But I think you should still make the recipe with it and taste it. Since different cuisines and recipes cook the same ingredient in very different ways, they tend to taste different. Every time I think of Halwa, it brings memories of my childhood in India. I remember attending various weddings and was in awe of the amount of food that was being made by the cooks. They were cooking for hundreds of guests in huge woks and cooking utensils. Indian weddings are usually attended by hundreds of guests since the wedding invitation usually says come with friends and family. The cooks would start making the food in the morning with huge quantities of vegetables, flour, ghee, oil, and of course the spices. Halwa can be made with various ingredients – semolina flour, wheat four, almonds, carrots, lentils, yams etc. My favorite is halwa made with semolina and almonds or just with almonds (I will post a recipe of almond halwa in a future post). The traditional way to make halwa is with lots of ghee and sugar. I have made modification to the recipe to cut down on the amount of ghee and sugar. A really good quality organic semolina is from Bob’s Red Mill. 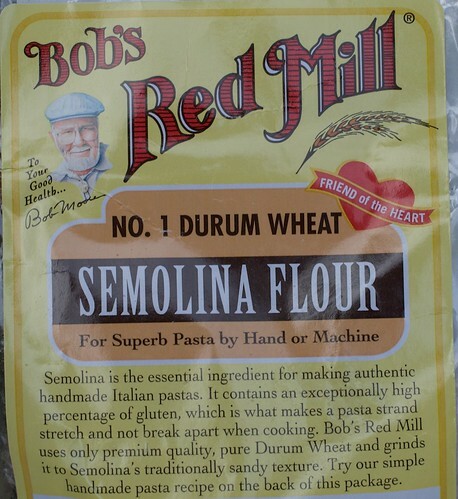 You can also buy the flour from any Indian store. It is called Sooji. 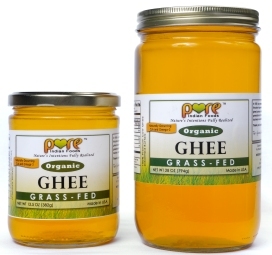 Ghee is available in Whole Foods and other grocery stores or at an Indian store. I prefer the Pure Indian Foods brand of ghee shown in the photo. You can get the ghee via mail order by clicking on the link under Online Stores. Ghee has an excellent nutty taste and a pale yellow color. Ghee is made by heating butter long enough until the moisture in the milk solids evaporate. 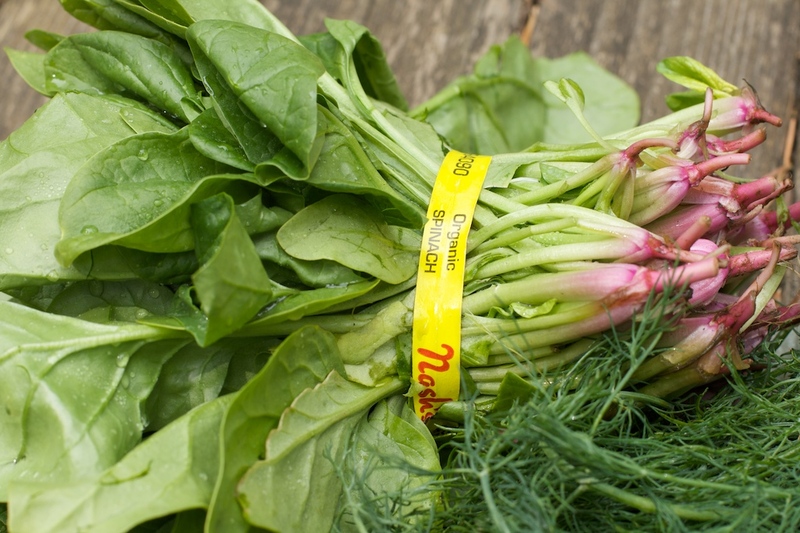 It has an excellent taste and is used in a variety of Indian dishes. I usually buy it ready made since it is too much of a hassle to make it from scratch.